"I'm exited because i'm going for the weekend with Et La'asot in Netanya. 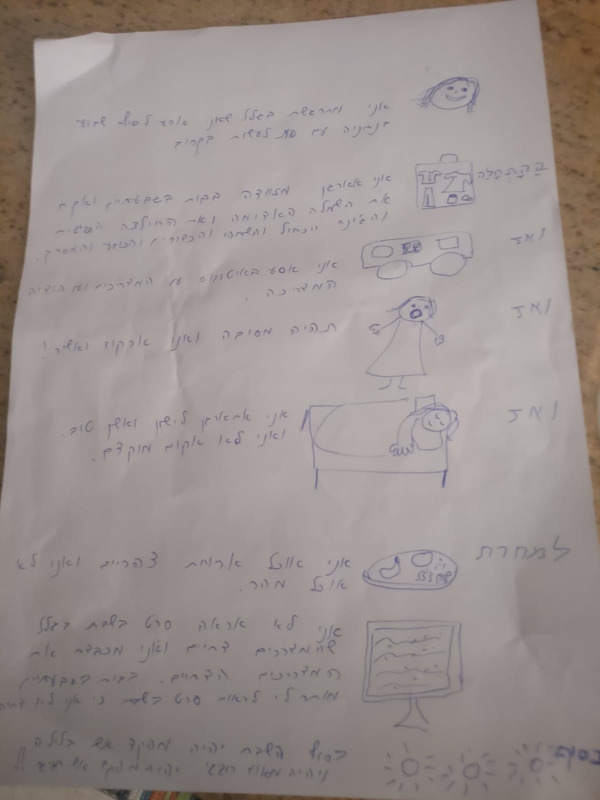 I will orgenize my suitcase at my home in Givatayim and pack my red dress and my fastive shirt and my blue jeans and the shampoo, the pills, the hat and the comb. I will ride the bus with the volunteers and my mentor, Hodaya. There will be a party and i'm gonna sing and dance! Than, i will go to sleep and i'll sleep well and i wont wake up early. On the next day, i will have lunch and i wont eat fast. I'm not going to watch T.V. because my mentors honor the shabbat and i honor that. At my house in Givatayim i can watch movies on saturday because i'm not religios. At the end of the shabbat there will be a festive fire show. There will be a festive fire show!